This copper-colored ale boasts flavors of apricots, brown sugar and nutmeg. Brewed since 1982, Chimay Première is the first beer ever produced by the Trappist monks of Notre-Dame de Scourmont Abbey in Belgium. Presentation: 750 ml custom brown magnum, corked and crowned (old style label). Cork is imprinted with a March 2000 bottle date. 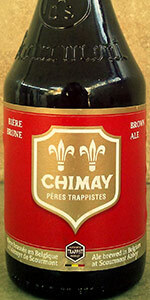 Poured in an authentic Chimay glasses given to us by Manneken-Brussel Imports, Inc. Appearance: Brown with a burgandy red hue with an infinite creamy white head from a tight tiny bubbled carbonation. Smell: Raw sweetness, peppery spiciness and light phenols. Taste: Soft powdery mouth feel with a crisp carbonation and medium body. Smooth. Very evident clove flavour up front and stays around throughout the beer. Hints of birch and ginger beer-like flavours, peppery medcinal phenols and light herbal tea hop flavour. Quite malty but it stays in the back. Fruitiness is likened to a delicate date sweetness and ripe plum. As the beer warms, there's also a suggestion of chocolate/carob. Finish dries a little though still a bit of residual sweetness leftover, herbal flavours also. Notes: We can die now. It's okay. Drinking this beer has made the cylce of life complete. Appearance  Nice foamy head and a beautiful, light brown color. Smell  Some malt and a deep clove aroma. Yes, it does get bigger if you pour it in the Chimay glass, swirl it, and let it sit. Taste  The taste is too tight after the pour. Wait ten to fifteen minutes and it will deliver on the bouquet: complex mix of yeast, malt, the clove again, various fruits, and even some hops. Theres also something in there that reminds me of a stout but I cant pin it. Mouthfeel  Nice carbonation and smooth. A little too foamy for my tastes, yet very easy on the tongue. Drinkability  Very good once it breathes. Someone could easily open up this beer, chug it, and never know what they had. Comments  This beer is very complex; I couldnt even begin to figure out all of the tastes. It is a real treat. Update: In 2004 I havent had an overly foamy sample so I am raising the Mouthfeel rating by 0.5. Surprised to see this on tap at the Liberty Taproom, Myrtle Beach. Served in proper Chimay chalice and a reasonable temperature. The beer seemed under carbonated, especially for a Belgian Trappist, and was evident in the thin foamstand and the more dull texture. The aromas are candy sweet, malty, fruity tart, and berry like. Flavors bring the same characteristics as the aromas, and add dark, dehydrated fruits, syrup sweetness, bread, yeast, and cherries. The body was firm and moderate despite the light caronation. Finishes quite sweet with a hop bittering. True to Trappist quality, this is one fine brew. A: Poured cloudy brownish amber into a snifter glass with a very large head that quickly dies down into a thin, swirly head. Yeast particles are clearly visible floating near the bottom of the glass. S: Malty, yeasty aromas dominate the smell. T: There's an immediate sense of malty sweetness, followed by some spices. The finish is a bit dry, but is interesting because it counteracts the initial sweetness. The dry finish completely disappears as the beer warms up and the overall taste becomes sweet, but not in any way overpowering. The presence of alcohol is completely masked. M: The beer has a light to medium body and feels smooth, mainly due to the level of carbonation. D: It's very easy to consume, and becomes even easier as it warms up and becomes sweeter. Pours a very hazy opaque prune juice color with a small 1/2 inch head that fades to a film on the top of the beer. No lacing on the drink down. Yeast sediment in the bottom of the glass. Smells of dark fruits like plums and raisins, caramel, yeast. Tastes of dark fruits, caramel, honey, yeast, cloves and maybe cinnamon. Very tasty. Beer is somewhat highly carbonated. Crisp and clean in the mouth. Excellent drinkability on this very delicious dubbel. Pours a murky, leather shade of tan, highly opaque with tiny, tiny sediments that can be seen floating around when held to the light. Gray colored head stays thin and sits atop the beer. Aroma is packed with caramel malts, licorice, dates, figs, and warming alcohol. Taste isn't far behind, also full of toasted malts and dark fruits, with some burnt sugar that hits heavy on the tongue. Grape flavors start to come out in a medicinal, but not off-putting kind of way. Some peppercorns faintly in the background along with a spice that is hard to put my finger on, could possibly be clove. The aftertaste on my tongue is wonderful - deep, bitter chocolate, along with bread, biscuits, oats, and campfire charcoal. Medium body with a large amount of carbonation. Another solid product out of Belgium, here. May not be the best, but it's certainly worth a try, and something I wouldn't pass up if offered. Highly complex, but right on the money. Apperance - Burnt copper brown, frothy caramel 1/3 head with great lacing. Aroma - I'm getting heavy brown bread with hints of honey. Taste - I'm initially getting a toasted biscuit flavor with some brown sugar in there for sure. Mouthfeel - Thin mouthfeel, moderate to high carbonation. Overall - This is a nice medium bodied beer, strong toasted biscuit flavor with some brown sugar. Not overly complex, which works well in this classic. The Chimay chalice fills with a murky brown copper beer (SRM 20). A half-inch, creamy beige head lingers all the while leaving fine lace. The aroma is dominated by fruity spice. Fruits include plums, while floral notes a woven with light cherry, apple, and raspberry. Warmth brings out musty oak and new leather. The flavor opens with oak, followed by rye bread with a balanced, but slightly bitter profile. Honey and vanilla linger in the background. The finish is mild in duration and flavor. Explosive, fine carbonation dominates the palate before the medium-bodied, slightly oily texture takes over. Alcohol is as expected with some astringency accompanying warmth. Chimay Red has earned its reputation and is good for relaxing with a creamy brie, but is less contemplative than I had expected. There's something about this brewery that promises so much, and delivers not enough. Dark reddish/brown color when poured. Big fluffy head that disapears as soon as you look away. Smell is lightly clovey, with a touch of sugar. The mouthfeel is light. Tingle of small bubbles on your tongue. What I taste is slightly musty malt, a sugary sweetness, and it finishes so quick, you wonder why there's not more taste in your glass. Pours a cloudy brown color with modest head that dissipates quickly. Has a great spicy sweet aroma. Taste is magnificent, this is so much better than their Tripel. I could drink these for hours, something I wouldn't try with the Grand Reserve. Well carbonated and very well balanced. Chimay's Premiere is a pleasant beer, if somewhat unfulfilling. It looks great, pouring a nice reddish orange with a huge head. Very appetizing in appearance. The nose is a stunner. It's a great mix of spice, malt and fruit, with a touch of bread. The flavor isn't quite as good as the look and smell would have you beleive. It's got everything you can get from the nose in the flavor, but sweeter and somewhat thin. It goes down very easily, but it's more like drinking a soft drink than a beer. Presentation: It was poured from a stubby brown 11.2oz bottle into a signature Chimay chalice that came with the gift set. Appearance: It has a deep burgundy color with reddish amber highlights. The body has a light haze with a few small bits of yeast suspended in the liquid just above the bottom of the chalice. Its head builds up tall and thick with a creamy off white colored head. The head slowly recedes to a thin wispy covering that hangs on tell the finish and even leaves behind a small amount of lace. Smell: The aroma has a pleasing dark sweet malt character with lots of good fruity esters and earthy Belgian yeast. There is a slight phenolic presence as well. Taste/Mouth feel: There is a good sweet malty body that is full of fruity notes like apricot, dates and plums that mixes with some earthy yeast. In the middle there is a very slight astringency. It also has some light herbal hops spice and a pleasant alcohol that adds depth and warmth. In the finish the sweetness fades off giving way to dry earthy yeast. The texture is smooth with a slid medium to full body and well balanced carbonation. Notes: This is a very solid Trappist Dubbel and an absolute joy to drink.